Dark Chocolate Chip Salted Caramel Cookies will satisfy all your cravings in one delicious cookie! My guess is you’re probably already convinced you need these Dark Chocolate Chip Salted Caramel Cookies in your life, but I’ll tell you some more about them anyway! I created a Basic Dark Chocolate Cookie and then I decided I wanted to add even more deliciousness to them! I came up with a few different versions (more on that later! ), but if I had to choose one as my own personal favorite, it would be this one! I pressed dark chocolate chips (Yes! Those are really dark chocolate chips, that dark cocoa powder is seriously dark!) and small pieces of caramel all over the top of the cookies before baking. As soon as they came out of the oven, I sprinkled them with a pinch of salt! I have two recommendations if you make these cookies (I’ll put them in the recipe as well so they are there if you print it off). First, don’t mix the chips and caramel pieces into the batter. Instead, press a bunch of them onto the top of the raw dough before baking (see my photos for an example). Because this recipe makes a thin cookie, the caramel will go through them easily. They turned out 100 times better when I didn’t mix them in. Second, let them cool fully before removing them from the baking sheet. 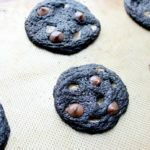 My impatience got the best of me (in my defense I was baking about 6 different cookies that day haha! ), and I broke a few in my rush to get them off the sheet. When I let them cool fully, they came off without a problem. These Dark Chocolate Chip Salted Caramel Cookies are perfection, in my eyes. A decadent, thin, chewy cookie with bursts of extra chocolate and gooey caramel, topped off with a hint of salt…what more could you need? Well, besides a tall, ice cold glass of milk! I plan to play around with the recipe some more to see if I can convert it to a fatter chewy cookie, and maybe a crispy version, just for fun. Do you have a favorite type of cookie? Preheat oven to 350 degrees F. Cream the butter and sugar together in a mixer on medium speed. Add the eggs one at a time, then the vanilla. In a separate medium sized bowl, mix together the flour, dark cocoa powder, baking soda, baking powder, and salt. Gradually add the mixture to the wet ingredients in the mixer until well combined. Roll the dough into one inch balls and press some chips and caramel pieces into the top (like I did for the cookies in the photo). This method works best for this particular recipe - as these are thin cookies and you don't want the caramel melting through them. Place dough balls 2 inches apart, as cookies will spread while baking. Bake for 8-10 minutes. Sprinkle a pinch of kosher salt onto each cookie and LET COOL before removing from the baking sheet. 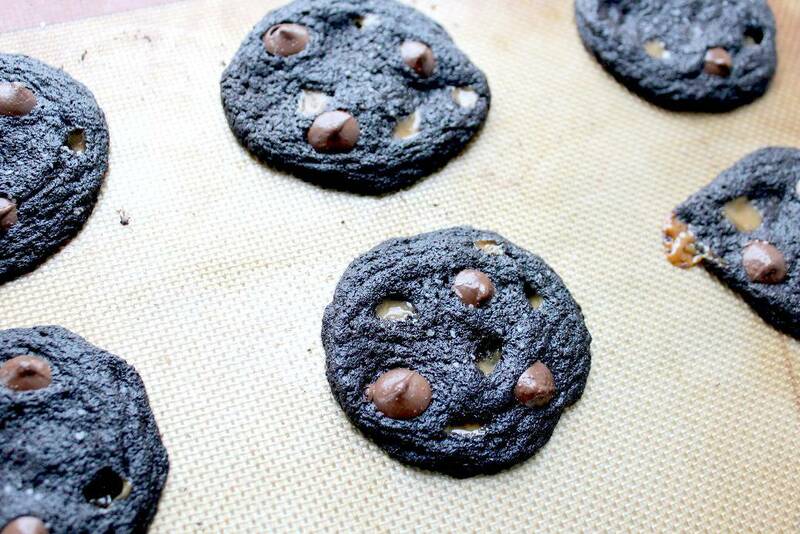 I love dark chocolate but never made cookies with it. I really like this idea and pairing it with caramel is just fantastic! These are amazing — everything I want in a cookie! My mouth is watering! Pour me a cup of coffee, I’ll be right over for cookies! Wow! These cookies look amazing! I’ve bookmarked this for later. My children will be delighted with these cookies! Would love to try this! This looks sooooo good! Yummy! This made me drool. Thank you for a great recipe! Oh yum! 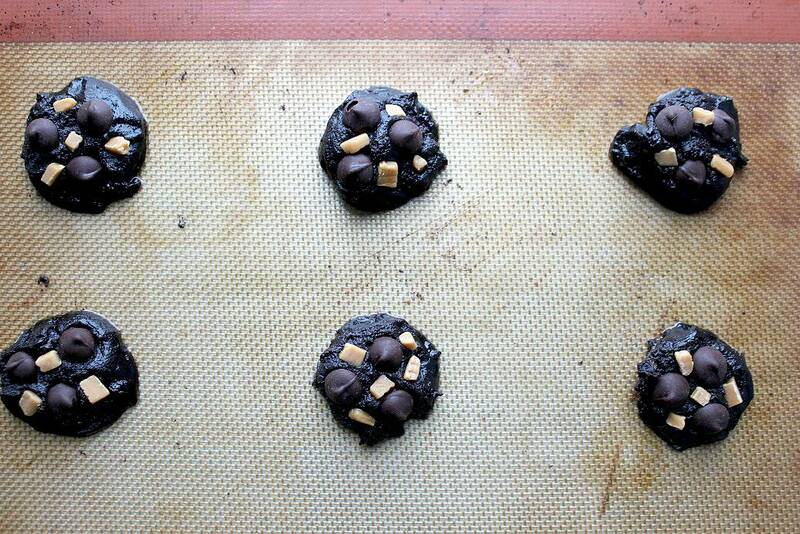 I make a similar dark chocolate chip cookie but love your addition of the salted caramel candies. Such a great flavor combo! These look amazing! I love salted caramel in desserts. I can’t wait to make this recipe. Yum! Pinned this for later. Love dark chocolate. Oh god those look INCREDIBLE! I love the combination of dark chocolate and salted caramel, it’s heaven! It’s my new favorite thing everrrrr!!! Wow, these look incredible! They would be hard to share in my household. This recipe makes 48 cookies!! Plenty to share…maybe! OMG these look so yummy! I definitely would eat all of them! Yum!! I absolutely love salted caramel, I can’t even imagine how much better it would be paired with dark chocolate. Thanks for sharing this! It’s delicious!! You should def try it sometime! I love that deep dark color of the chocolate! And who doesn’t love chocolate and caramel. I definitely need these in my life! I was surprised how dark they came out, but I love it too! Hope you like them! Yes!! It’s such a good combination! Whooo… Chocolate! I admit that I am kind of chocolate addict! But, my doctor told me not to eat any desserts until my pre-diabete gets off first. Your pictures of dark chocolate chips make me wanting to eat… I’ve pinned yours in my pinterest board 🙂 Thank you for sharing! I know the feeling…I eat low carb as much as possible and as little sugar as possible, but sometimes you have to “cheat”…unlesw your doctor says no of course! I am not normally a fan of anything carmel… but I might have to give these a try! These look so amazing, definitely going to have to give them a try! Thank you!! Say no more! Looks so yummy! !